We’re having the most beautiful June imaginable, and I’m sorry to say I have not been spending much time in the saddle. I moved houses last weekend, and the run up to that event, and then the ensuing chaos of unpacking that followed have really eaten into the amount of time I spent riding lately. Fred is going beautifully, and both boys are well and happy. I’ll check back in with the proper post after the Fourth of July. Fred got a gold star and extra cookies last night – we hacked around the property (and it’s pretty big) all by ourselves. 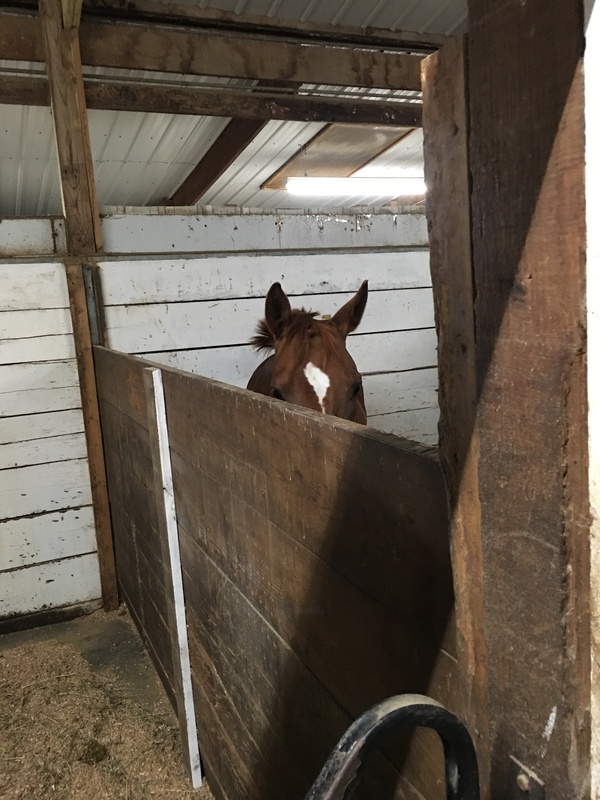 Everyone else was in the barn, but Fred was totally cool. Just a quick update: Jag and Fred are settling into their new digs. Both were superstars yesterday, marching onto the trailer with no complaints, hauling quietly, and comporting themselves with good manners upon arrival. Fred and I will take our maiden voyage tonight. We’re days away from moving to the new barn, and I’m trying to enjoy my remaining time at Uulke as much as possible. The weather has been cooperating, enabling met to get Fred outside – finally! 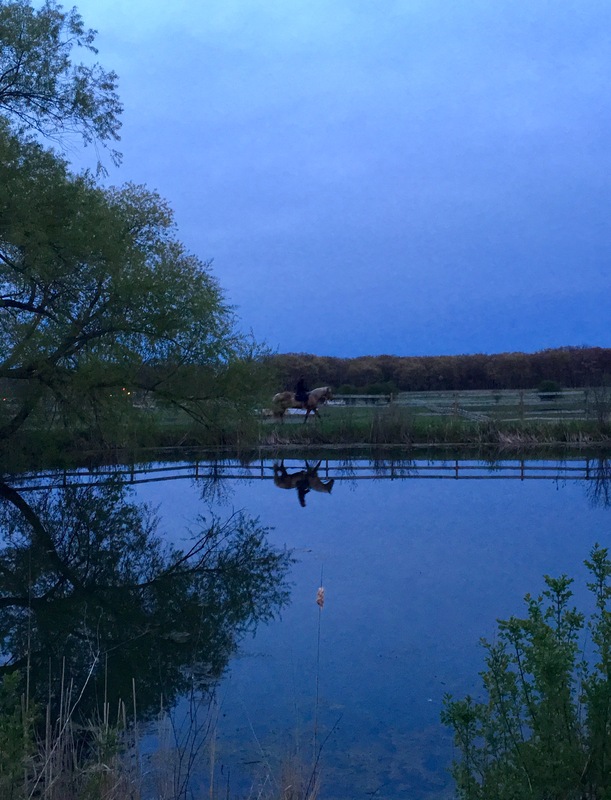 He’s a different horse when he’s not in the arena, and I think the weekend’s wanderings around the property really helped him, because we had a pretty good ride tonight. He’s still not as forward as I’d like but we’re getting there, and I’m increasingly confident in my ability to handle this issue. “Ride like a trainer,” Christy says repeatedly, reminding me to hone my responses, not accept “no” for an answer and to take responsibility. “When you’re in the saddle, he’s responsive, period,” she insists. We muddled through Training I tonight, and as you can see, had some nice moments. We also blew a canter depart and needed three more tries to get it, and had to stop to poop (another issue I will tackle later.) Free walk was solid, stretchy trot needs work, and we wavered between dreadful, competent and pretty good. Fred is strong enough now to work on a 20m circle, so we gave it a whirl. I’m actually going to re-memorize the Training tests, because the variety and pace of of the tests really is good for Fred. Tomorrow we’ll just hack around the property. Wednesday and Thursday we’ll work. Christy and i continue to cobble together our plans but for the near term, these will be our last rides with her, which really bums me out. We’re good friends, though and this won’t be the last you hear about her. 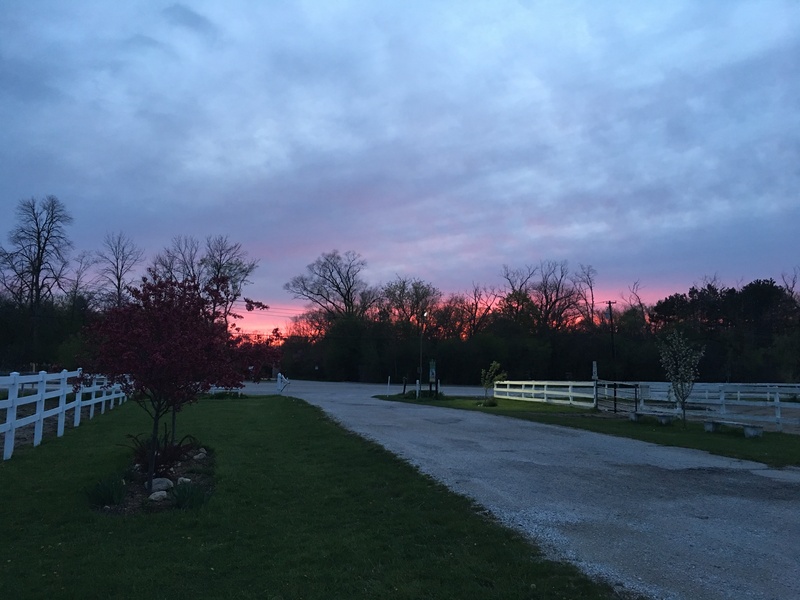 In the meantime, if you’re not doing so already, keep an eye on her blog – Dressage Fundamentals – lots of good stuff there. I’ve been reconnecting with my riding lately in a way that I haven’t for a long time. Life has been busy, and full of distraction. 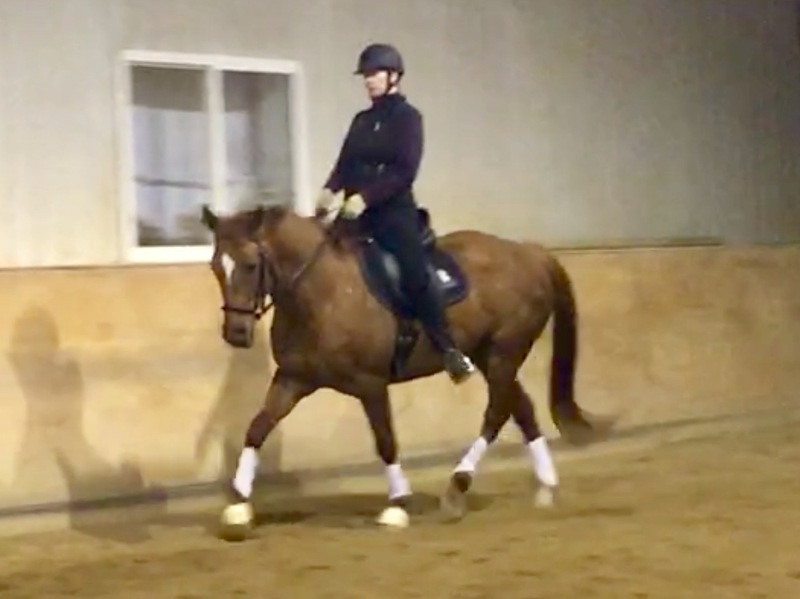 Forcing myself to into my own head, into the Zen of being present with the horse, and really riding – managing every stride, keeping shoulders and haunches straight, maintaining tempo – has been extra challenging lately. There’s a lot of background noise continually threatening my concentration. Just like with life, it’s easier to simply be a passenger, but when you pick up the reins, put your leg on and take control, you have a better ride. At the gym in the morning and at the barn at night, I’ve been making a point of really making myself sweat. No more zoning out on the bike, no more checking out mid-ride. I’m paying attention. More often than not, since Fred isn’t yet up to strenuous work, I focus on myself. That means keeping my core engaged – continually. Or dropping my stirrups and posting, not sitting, keeping leg pressure on, staying balanced, light on his back and not pinching with my knees. I force myself to work, and to pay attention, not letting my leg dangle, or my core relax. And it’s showing in the ride, because Fred is improving by leaps and bounds, despite not being a leaps and downs sort of guy. The evidence? A line of new muscle along his top line, and a new eagerness to work. He feels better, and I’m getting there. 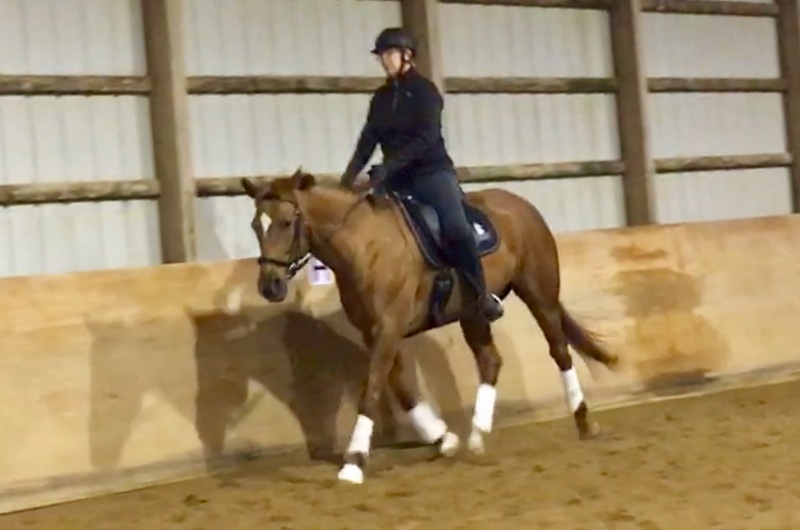 “Ride the trot you want, not the trot you have.” Christy is all over my case, not letting me accept “no” from Fred when I ask for more length in his stride. But instead of going to the whip or nagging him with my spur, she’s requiring us to develop a response from my seat. Ride the trot you want, not the trot you have. It’s a tidy analogy for life, too. On that note, I have news of an upcoming change involving a tough decision. I’m moving, and am moving the horses with me. We’ll still be in the Chicago area, but both Jag and Derby will be relocating in May to a barn about 20 minutes from where I work. At this point in time, I need my life to be a bit more contained. Getting the ponies closer to work will be a huge step in the right direction. Moving Fred from Uulke and Jag from my friend Jeff’s place is wrenching – both horses are doing so well, and seem so happy. The place I’ve found has lots to love – a field full of elderly pensioners who are glossy and in good weight, lots of different turnout scenarios, stalls that are spacious and airy, gorgeous hay, bridle paths for out-of-ring hacks — lots of comfort for the creatures. However, this will necessitate a change in trainer, and I’m gutted. Christy and I are hatching some other plans, but for my regular work, I’ll be trying out the trainers operating out of the new place. In the meantime, I’m jamming as many lessons into the schedule with Christy as I can. She’s switching gears on me, determined to make me more self-aware and self-correcting, more responsible. It’s hard, requiring vigilance and attention, but once you start to pay attention, your adjustments start to feel instinctive, reflexive, even, and I’m getting more of that trot I want. Used to be that March was one of my least favorite months to ride. 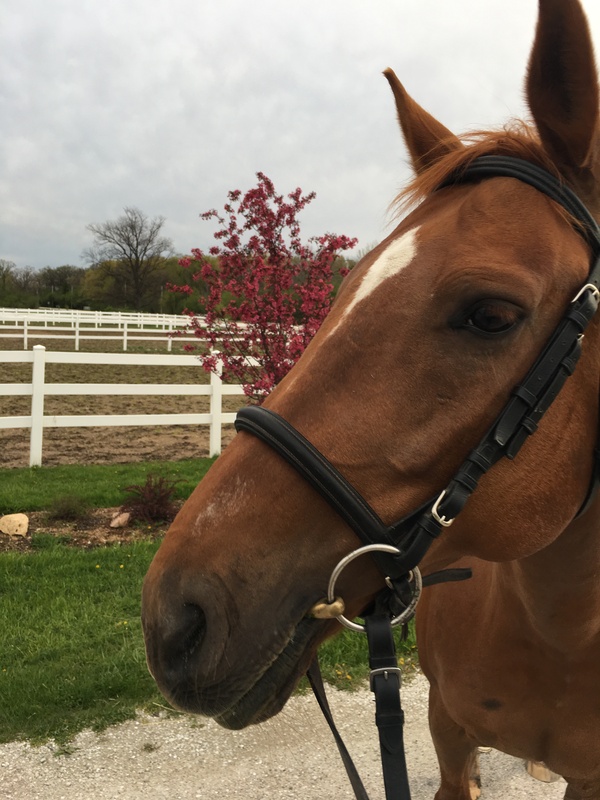 When you’re riding a flighty Thoroughbred, Spring rides can be hair-raising, heck, just walking in from the paddock can be an adventure. Raise your hand if you’ve ever found yourself flying a 1000 lb kite. I know some of you know what I’m talking about. Derby’s superpower was levitating while putting no pressure on the lead rope, which, if you think about it, means I’d be walking along, ignorant of the fact that my horse was floating along somewhere over my head. Needless to say, with that one, I snapped to pretty quickly and conformed to Pony Club approved methods of handling my horse. Fred is much, much easier. He’s earthbound and fairly unflappable, which makes him a delightful change of pace during changeable March weather. Not too much concerns him. We’ll be riding outside soon and I can’t wait. 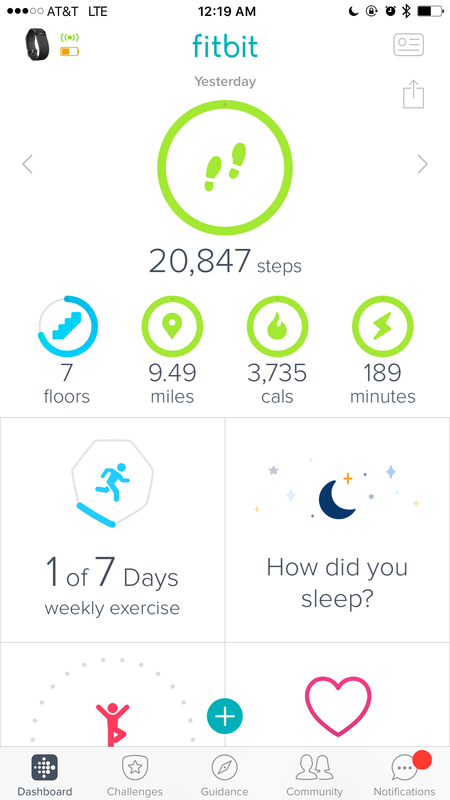 Part of the fitting up of Fred includes a lot of walking. Purposeful, marching walking to be sure, which lots of lateral work plugged into it, but walking nonetheless. That will be more fun for both of us when we can play in the sandbox outside, and start to explore the trails. In the meantime, we’re getting there. Fred had such a case of the friskies last week that he was cantering off when I put my leg on, looking for a bigger stride at the trot. At this stage, forward is good. I let him go each time. I’ll worry about packaging the power later. Tonight, he was tight and pissy, so I got off his back and out of his way, hopping up into a half seat, and just let him roll at the canter. 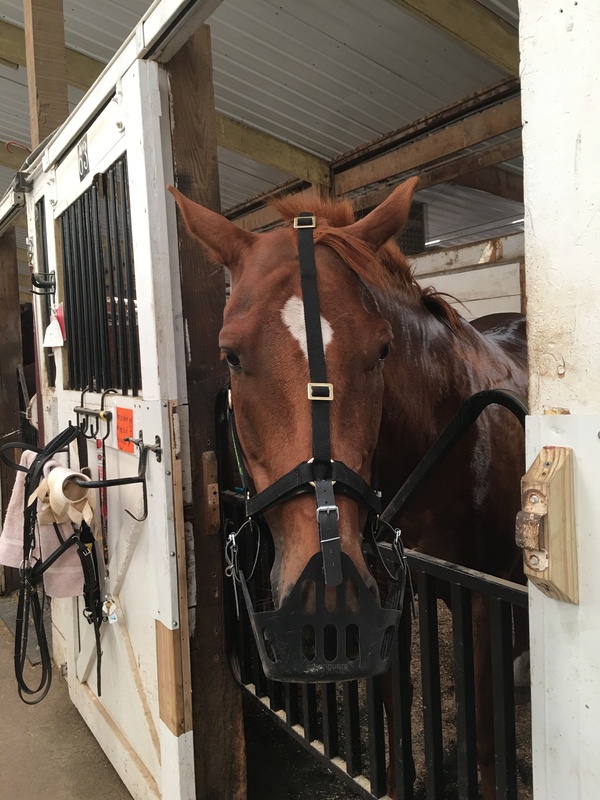 He is insisting upon stretching as we walk – really stretching down to the end of the reins, all the way through, and I need to remember to incorporate these stretch breaks throughout the ride, in addition to (or in combination with) the walk breaks. 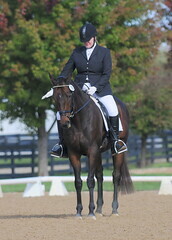 After working the stretch in the trot, I had a much happier horse, and little wonder. I’ll need to ride him low, comfortable carriage until he works up the strength to carry himself. Which will hopefully be soon. Fred’s a fun horse to ride, even on a crappy day.